Pour boiling water over oats, stir and let sit about 15 minutes to cool a bit. Add 3 TBSP butter and the egg; blend. 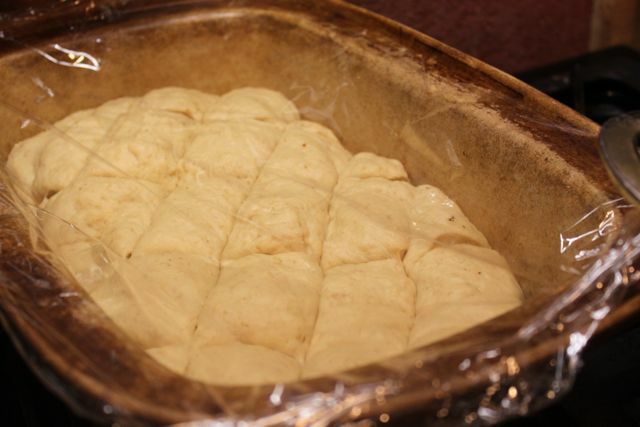 Add yeast, sugar, salt, and enough flour to hold dough together without making it too dry. I know I have enough flour when the dough forms a ball and cleans the side of the bowl (in my Bosch mixer). Knead dough for 3-5 minutes in a mixer or by hand. Let rest 15-20 minutes; punch down, and spread in a greased 9 x 13 pan. Using a sharp knife, cut into squares or diamonds. Cover with plastic wrap and let rise until doubled–about 45 minutes. 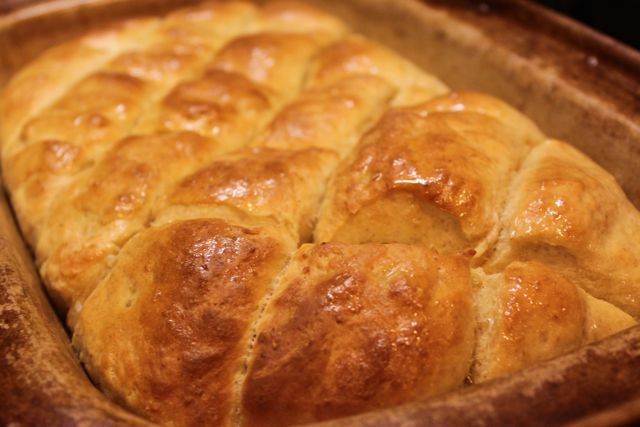 Melt the 6 TBSP butter in the microwave and brush about half of it over the raised rolls. Bake in a 350 oven for 15 minutes. Meanwhile, add your garlic, cheese, and seasonings to the remaining 3 TBSP melted butter. Pull bread out after 15 minutes of baking and brush with herb/cheese mixture. Continue baking for another 12-15 minutes until golden brown. Did you grease the pan with butter? and is it a softer, elasticy dough..slightly moister? Sorry I didn’t get this sooner! Hope I’m not too late … I usually do spray a little Pam in my stoneware, although I don’t think I need to. It’s just habit. And yes, the dough is softer than most. I hope you like it! You’ll have to let me know 🙂 Have fun at your party! Not a problem..it’s ok..i greased it with butter..what’s not to love about that..and yep..i kneaded it just right…they are rising beautifully as we ‘im’ and about to go in the oven 😀 I’ll check it as it bakes if the sides get a bit brown..though I don’t think it will..yummy yummy..